As the owner of a rabbit, it is your responsibility to know when temperatures are too high for your bunny's safety. Bunnies can sweat, but they do not sweat a lot; and their ability to cool their bodies by sweating is limited. Keeping your bunny cool is the best way to avoid potential problems caused by his overheating. Your bunnies' sweating ability is severely limited by the small size of his sweat glands and the location of his sweat glands -- inside of his mouth. If you see your bunny panting, he is likely overheated and trying to cool himself down. Rabbits can pant, but they do not pant particularly well, so panting is not very effective, either. Your fur-covered bunny does not sweat the way you do. Rabbits face a serious risk of becoming overheated during warm months, potentially suffering health crises up to death. According to the Fund for Animals website, bunnies can become overheated when temperatures exceed 84 degrees Fahrenheit. 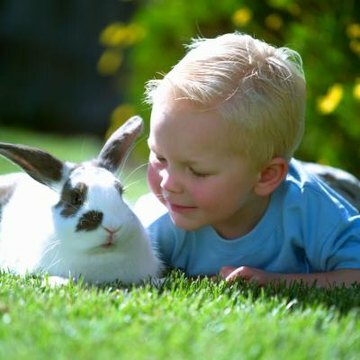 Your bunny will be most comfortable if you keep him in a climate-controlled environment, such as inside your home, when its hot outside. Signs that your bunny is overheating include panting, drooling, lethargy, lack of appetite, decreased water intake, weakness and a loss of coordination. If your bunny becomes severely dehydrated he will stop panting, may experience convulsions, go into a coma or even die. If you notice your bunny panting or suspect that your bunny is becoming overheated, you can take steps to help cool him down. Remove your bunny from the hot environment and bring him into a cooler area. Spray him lightly with cool, but not cold, water. You can also wrap your bunny in a cool, wet towel. If your bunny is overheated, you should try to cool him down and then transport him to the veterinarian, where he can be further treated and given fluids.